Thompson & Knight is one of the world's premier energy firms, with a particular emphasis on finance, business transactions, and an ability to resolve our clients' controversies in or out of court. 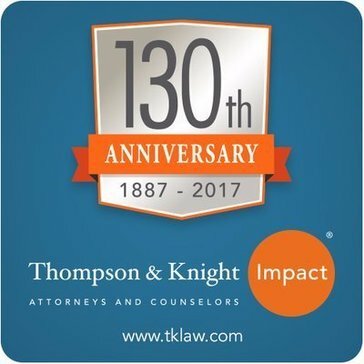 Thompson & Knight creates, fosters, and maintains a meaningful and substantively diverse and inclusive workplace, environment, and culture. The Firm promotes diversity in thought and action through the organizations we support; the companies with whom we do business; the clients whom we serve; and the employment, development, and advancement of a diverse body of highly valued personnel. Work for Thompson & Knight? Learning about Thompson & Knight? * We monitor all Thompson & Knight reviews to prevent fraudulent reviews and keep review quality high. We do not post reviews by company employees or direct competitors. Validated reviews require the user to submit a screenshot of the product containing their user ID, in order to verify a user is an actual user of the product. Hi there! Are you looking to implement a solution like Thompson & Knight?